Ride the unique Retired Racehorse Project’s Thoroughbred Makeover cross-country course with the high-scoring pair, EN’s own Kate Samuels and Turkomani, aka Turkey! Unlike a regular horse trials or three-day event, in which cross country is timed with time and jump penalties added, the Retired Racehorse Project’s Thoroughbred Makeover, as a competition to gauge the potential of horses recently off the track, scores its cross country rounds. Individual jumps were scored 0 to 3, plus scores from 0 to 10 in impression categories including rideability, between fences and open gallop. Combinations also picked up more points for selecting the Novice options over Beginner Novice. 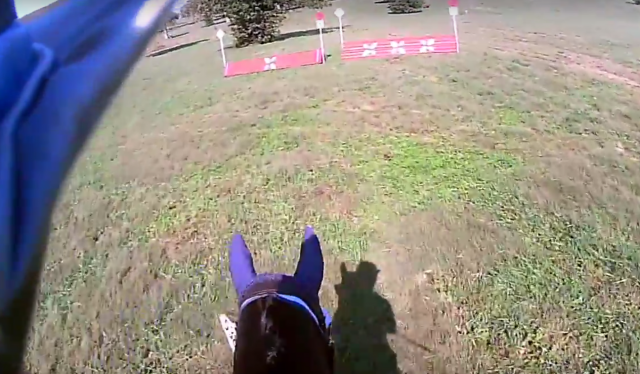 The highest-scoring combination on cross country at the 2018 Thoroughbred Makeover was Eventing Nation’s own Kate Samuels and Turkomani, known to his friends as Turkey. Demonstrating all of the best qualities of both off-track Thoroughbreds and future stars of eventing, Samuels and Turkey eventually went on to finish fifth in the large eventing division. This is only the beginning for this pair! Keep an eye on Eventing Nation for further reports on Kate Samuels and Turkomani — we can’t wait to see where they go next!